International student Jiaqi “Kyki” Li had a rocky start as a UW freshman. She stayed up most of the night trying to complete her first class assignment — 60 pages of reading and a two-page response essay — but was unable to finish. She came to class the next day empty-handed. Li (BA, Dance, Anthropology, 2018) got that help, and the following year become a tutor at OWRC. She went on to complete two majors, perform in dance concerts, pursue dance research, receive three academic scholarships, and study abroad in Mexico, Jordan, and Italy. Simply put, she thrived after her inauspicious start. Everything I learned over the past four years has been pivotal and preparational for what is coming next. Li also completed a research project in dance, which she presented at the UW's Undergraduate Research Symposium. With dance professor Juliet McMains as her adviser, she comparatively traced the ways yoga practice has adapted, merged, and changed with the larger cultural context in the United States and China. A summer study abroad program in Oaxaca, Mexico, provided another opportunity to explore dance. Led by UW Bothell lecturer Diana Garcia Snyder, the program focused on the socio-economic and political context of indigenous grassroots activism, as well as dance and movement training. Students had opportunities to join with the local community in redefining and celebrating indigenous identities and traditions. After graduating this month, Li will attend several dance festivals in the U.S. and abroad. She hasn’t planned much beyond that — she’s been too busy with final projects, including a collaboration with students from other arts disciplines. Together they are exploring new ways of presenting dance, from an online gallery that documents the process of making a dance to a zine that delves into how to view modern dance. 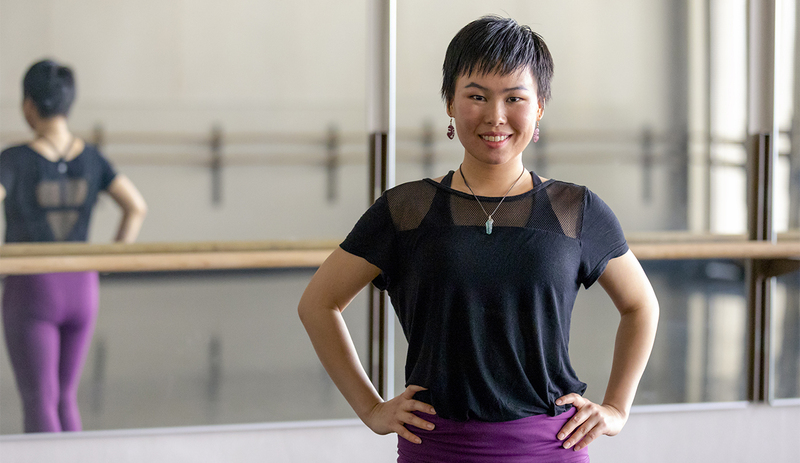 Li received a Mary Gates Leadership Scholarship to pursue the interdisciplinary project; she also has received a Dance Program Scholarship and the Dance Department Summer Study Award during her time at the UW. Not bad for a student who tanked her very first college assignment. Learn how you can support College of Arts & Sciences students like Kyki Li.